Hometown Toyota has the best selection of the 2017 Toyota Highlander near Boise. Experience it for yourself with a test drive at Hometown Toyota in Ontario. The 2017 Toyota Highlander is a midsize crossover that's been part of the Japanese automaker's lineup since 2000 as a 2001 model year. The current model is part what is now the vehicle's third-generation that went on sale here for the 2014 model year, so this year sees the Highlander getting a very handsome mid-cycle refreshing. If you're in the market for a new midsize crossover and you've not got the Highlander near the top of your list of ones to consider, it's definitely time to give it a closer look as you'll be missing out big time if you don't. This year, the 2017 Toyota Highlander benefits from a facelift that delivers a somewhat more aggressive look, extra power, an even more comprehensive suite of safety features, and a new sportier SE model added to the spacious crossover utility vehicle's lineup. The SE joins the existing models in the Highlander family, which are the LE, LE Plus, XLE, Limited, and Limited Platinum models. The hybrid version of the Highlander now also comes in LE and XLE trims as well as the Limited and Limited Platinum trims that carry over from the last model year. When it comes to being family friendly, there's very little out there making a strong case for being better than the fabulously versatile and practical three-row 2017 Toyota Highlander. The Highlander strikes a superbly middle-of-the-road position among vehicles of this type, as one that's handsomely rugged with strong truck influences on the outside, but is still an utterly carlike, family-friendly minivan alternative when it comes to driving it and riding in it. 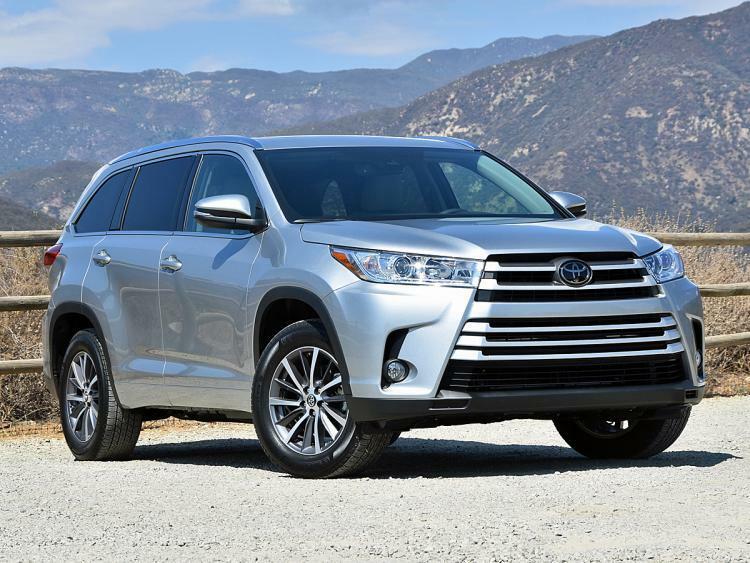 The majority of 2017 Toyota Highlander models sold are likely to be powered by the revised, direct-injected 3.5-liter V-6, which produces 25 extra horsepower this time around for a total output of 295 horsepower. The V-6 models also come with an excellent new eight-speed automatic transmission with an expanded torque-converter lockup range and a more direct feel to the way it drives. As well as being faster than the previous version, this new take on the familiar powertrain also improves on fuel economy, which can now be as good as 21 mpg in the city and 27 mpg on the highway. * All V-6 versions of the Highlander also benefit from engine stop-start technology, which shuts the engine off when idling at the lights and automatically restarts it when your foot comes off the brake pedal. The base LE model in the Highlander family is a front-wheel drive only offering and this one is powered by a 185 horsepower 2.7-liter four-cylinder unit that comes mated to six-speed automatic transmission. Hybrid Highlander variants also get direct injection and an Atkinson-cycle version of the V-6 engine. Of course, the hybrid propulsion system also includes a pair of electric motors, one at the front and one at the back to deliver all-wheel-drive, for a net 306 horsepower that's up by 26 horsepower on last year's model and gets 30 mpg in the city and 28 mpg on the highway. One of many areas where the Highlander excels is the way it drives, so don't be fooled or put off by the slightly macho SUV exterior styling. The latest Highlander handles noticeably more responsively than its styling may suggest, and although the ride quality does firm up a little when fitted with the 19-inch wheels, even the Highlander SE with 19s and its sportier suspension tuning still isn't what you'd consider to be too harsh.